Last year for April Fools day I decided to play a prank on my girlfriend. She always leaves for work much earlier in the morning than I did at the time. I got my prank idea from a picture of an air horn duct taped under a computer chair. 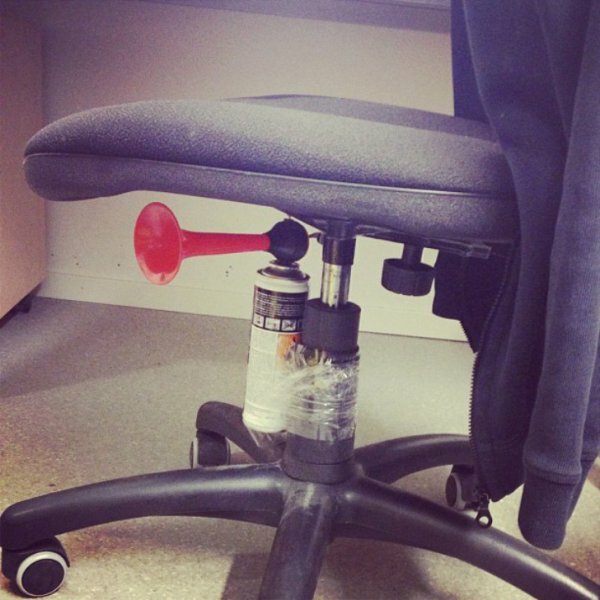 The idea here is that the air horn would go off when the target sat in his or her chair. Of course I got this idea at 1 AM that night. I got up out of bed, and went to the store. I tried to go to a Walmart that stated it was 24 hours. Their hours were marked wrong online (and I am sure they still are). I tried to go to a CVS, and a Walgreen’s, they didn’t have any air horns. So I traveled 20 minutes north to the nearest Meijer. They had mini air horns! These were perfect to hide. I bought three. I also bought some funny duct tape (mustache) and some cream cheese (we will get to that later). I secured my traps all around the house in a way that forced her to hit all three. She would have had to leave through a window in order to avoid any of them. I was renting a house built in the early 1900s at the time. So there were no shortage of unnecessary doors. The first horn was placed behind the bathroom door. There was only one full bathroom in that house, so it was a sure thing. The next horn was placed behind a swinging butler door that led to the kitchen. Lastly, I placed the remaining horn behind a door that separates the kitchen from the basement / outside door. She could have avoided this horn if she left through the front or back door, but she always left through the side door. I forgot to mention that I tested these horns in my car at 2 AM on the way home so I would not wake anyone up near my house (they were SO LOUD). I was so giddy with laughter I could hardly get to sleep. April 1st she wakes up and gets out of bed. She starts to make her way out of the bedroom and I am literally biting my pillow to keep myself from bursting out with laughter. She immediately goes to the bathroom door (like we all do when we wake up) and the horn honks full blast. She yells some swear words and goes about her day. I try to go back to sleep (it’s 5 in the morning). 30 minutes later or so, she makes her way down to the kitchen and I hear that horn blast. This time she is pissed. She comes running up to the bedroom where I am sleeping / laughing uncontrollably and she punches me in the shoulder (it was playful). She asks me if there are any more, and I avoid the question. This time an hour goes by and she is just going about her morning rituals while I sleep in bed. The last horn blasts! She screams and leaves the house. Anyway all that and it was an incredible morning for the both of us. This was all possibly because of the tile floors. Carpet would have posed some difficult problems when attempting to secure anything down. This wasn’t all I did. Luckily, its all she encountered. For some reason she had this habit of using my deodorant. I guess she ran out and just never bothered to replace hers. I talked to her about this, I wasn’t a fan of sharing deodorant. 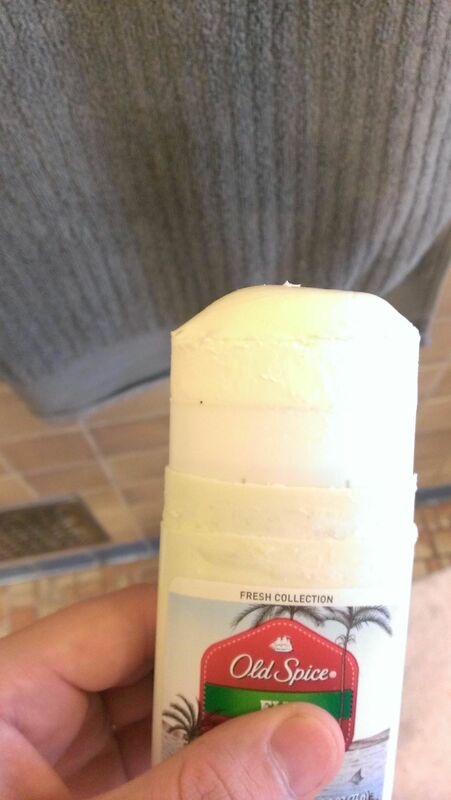 So I rolled my deodorant stick in a few inches while pushing into the cream cheese. They were both about the same constancy and color. I even put a little arm hair in the top and molded to to look like it was used. Then I just rolled it back down and sat it back in the medicine cabinet. Luckily for me, she didn’t use this. This could have been a relationship deal breaker after all I did.